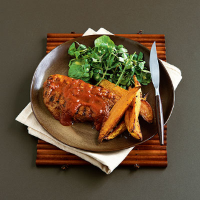 Spice up top-quality rump steak with a ready-made chilled Cajun marinade, and serve with chunky oven-baked sweet potato wedges. Preheat the oven to 190°C, gas mark 5. Place the steaks and half the marinade in a shallow dish. Coat the meat thoroughly, then cover and place in the fridge to marinate for at least 20 minutes. Meanwhile, cut each sweet potato into 8 long wedges. Place in a roasting tin, drizzle with 2 tablespoons of the oil, and season with pepper. Bake for 30 minutes, turning once, until golden around the edges and tender when pierced with a sharp knife. Between 10 and 25 minutes before the baked wedges are ready, heat the remaining oil in a frying pan or griddle over a medium heat. When the pan is hot and just beginning to smoke, cook the steaks according to your taste. For a rare steak, cook for 2-3 minutes per side; for medium, cook for 4-5 minutes per side and for well done, cook for 5-6 minutes per side. Remove the steaks from the pan and allow to rest while you heat the remaining Cajun sauce until piping hot. Serve the steaks with the wedges and the hot Cajun sauce, together with a 135g pack Waitrose Watercress, Rocket and Spinach Salad, drizzled with Waitrose Perfectly Balanced Mango and Lime Fresh Dressing. Marinate the meat for up to 24 hours in the fridge in advance of cooking to save time. This recipe can be easily doubled or made using different cuts of steak such as fillet or sirloin.